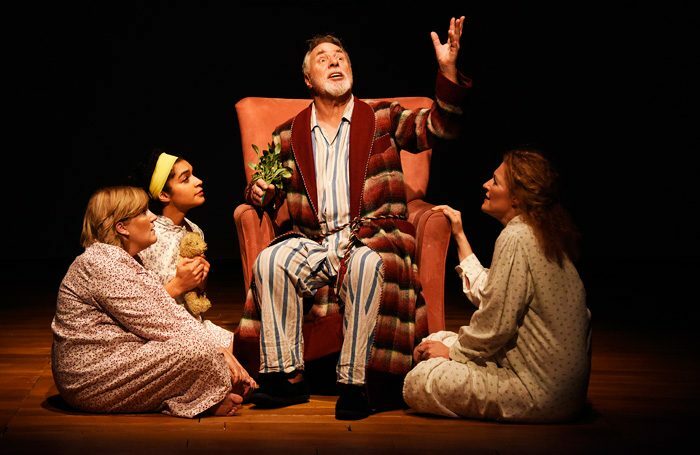 In this revival of Ben Benison’s 2008 play, originally staged in Scarborough, Shakespeare’s tragedy plays out in a domestic setting – that of the house of ailing fisherman Jack Lear and his daughters. This relocation works remarkably well. It’s set during the 1970s, the very point at which the city’s fishing industry was declining, and taps into the sense of a way of life that’s crumbling, just as Lear’s own little kingdom crumbles about him. Barrie Rutter, who also directs, returns to the role of Lear. It’s a heartbreaking performance. A booming braggart with his daughters as he divides up the family spoils, he gradually shrinks, transforming into a frail, gently shuffling figure, whose gestures, and blank-eyed stares, speak of a man whose life has unspooled. This waning force is contrasted with the restless energy of the sea via Kate Unwin’s set, which is fringed with fishing nets and features two sails, one of which is unfurled. Wave-like images are projected on it during Lear’s meltdown. Rutter’s production is also buoyed by a strong set of performances, not least from Andy Cryer as the unctuous Edmund, who, with his flared suit and medallion, is slippery, falsely charming, and bursting with his own bravado. Featuring a range of sea-shanty style songs by Eliza Carthy, performed a cappella by the cast, the play feels very much of the city, replete with dark humour: “With us, it’s steel” booms Lear, as he chucks two swords to daughters Morgana and Freda for them to duel, Viking-style. Benison’s blank verse script is filled with Norse allusions and contains some startling imagery, Lear, we’re told, would rather have his bones picked clean at sea than become “maggot churned” in the ground. With its mentions of myth, along with the superstitions of Hull’s fishing community, this family drama has the weight of an ancient epic.